The Handicapper is a handicapping tool for MLB-, NBA- and NHL-betting. Version 5 is the second version that runs without Microsoft Excel. 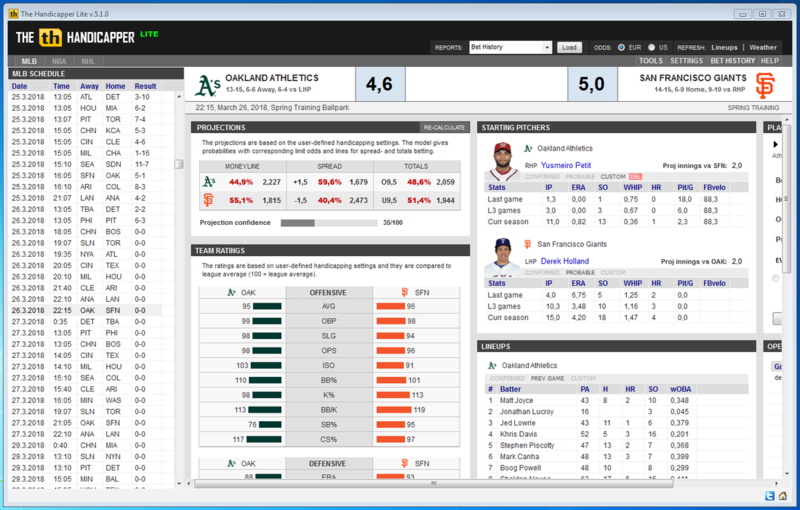 The first release of The Handicapper v5 is now available. 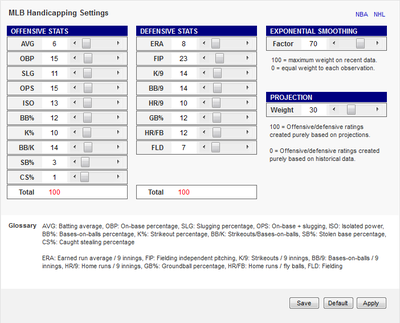 Version 5.1.0 includes an MLB and NBA handicapping framework (NHL will be added in a later release). The MLB framework builds on previous work (versions 1-4 of The Handicapper), the NBA framework is built from scratch for version 5. There is still quite a lot of features that are ready but not implemented and a few that are waiting to be written in this release (v5.1.0). 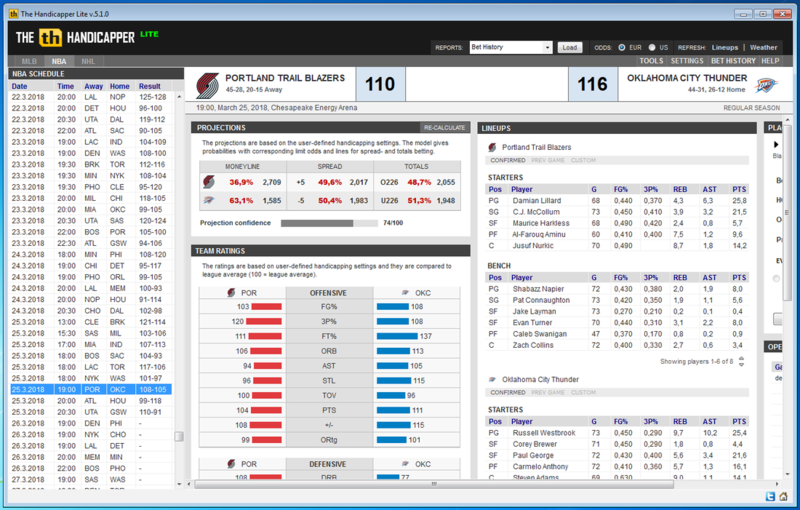 In later releases I am planning on adding a few reports, more customization- and automation options and information on odds changes, just to name a few. The Help-section, with information on how to use the software, is waiting to be written. As always, I’ve have saved all the descriptive (boring) work for last. The biggest changes and also the most important feature with v5, is to give the user tools to implement own ideas in their handicapping. As the NBA framework is something totally new it's highly recommended to challenge the handicapping results with skepticism and common sense. The online manual can be found here. The program is free to download. You can download it from the website or via Google Drive. Please note that some antivirus software does not like the file (.exe) and you might have to make adjustments to the settings of your antivirus software for The Handicapper to work. The software requires Microsoft .NET Framework 4.6.1 to be installed, which is usually the case with newer versions of Windows. If you have issues with launching the program try installing Microsoft .NET Framework 4.6.1. If you already have The Handicapper installed ​​an update is installed by replacing the existing file (th5.exe) with the update (also th5.exe). ​The Handicapper is free of charge to use. If you find it useful, a donation for covering R/D and maintenance costs is highly appreciated. 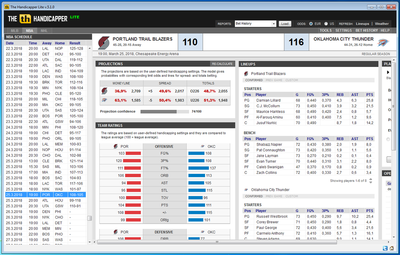 -There was a data issue in yesterdays NBA data, which is fixed with todays update. The issue made the software crash when trying to select NBA matchups. 27/03/2018 -- The Handicapper v5.1.0 is pulished! 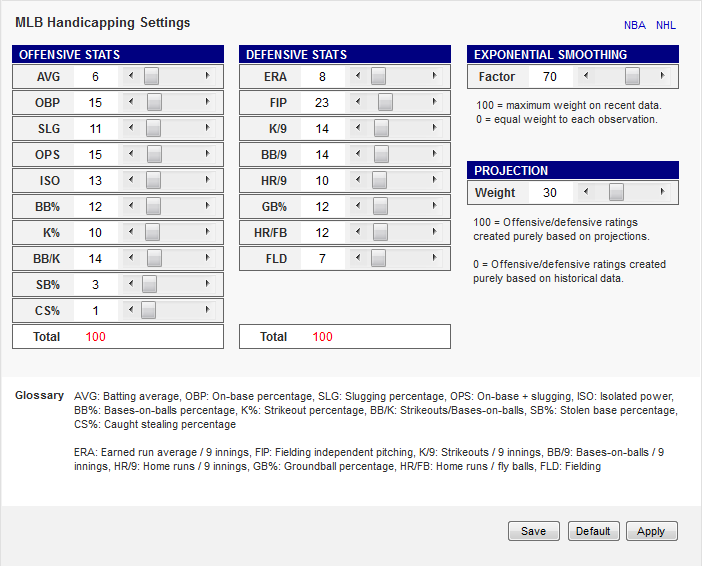 The Handicapper v5.1.0 is published. Download the file from the section above. 20/02/2018 -- The Handicapper v5 is coming soon!